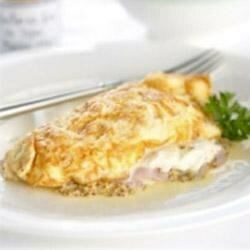 "This omelette, filled with ham, sour cream, and Dijon mustard, makes a filling breakfast or satisfying supper." Beat eggs with salt, pepper and water. Heat butter in a pan over high heat until frothing. Pour in egg mix. Turn down heat slightly. Gently push cooked egg to the middle of pan with a wooden fork, allowing uncooked egg to run underneath. When omelette is set on top - and browned underneath, spread with Maille(R) Old Style mustard, sour cream and sprinkle with chopped ham. Flip omelette over and slide onto a serving plate. Best served with tomato salad, tossed in vinaigrette with basil leaves. Tender shrimp with sausage and peppers served over cheesy grits. It was delicious! I wouldn't change a thing! A great way to use leftover ham. I will make this again. This was a great dish to make with a low amount of ingredients but pretty tasty. I put a bit too much salt in mine. But otherwise healthy, thanks mate!